So… imagine my joy when a friend pointed me in the direction of Teatro Vittoria in Testaccio where the current production is Il Monello which translates as The Kid. OK – you’re ahead of me already. It is The Kid as in the Charlie Chaplin creation. And it is (almost) completely silent. To explain – it’s a frame-for-frame recreation of the original film (well, I think so… it has been a few years since my last viewing… ) It’s the one where Charlie accidentally adopts a young scamp – the Kid of the title – and they rub along together on the lower edge of society getting into various scrapes until the inevitable revelation threatens to tear them apart. If you’re not familiar with the story I won’t spoil it by telling you the outcome. I will tell that you may need some hankies with Chaplin’s original music tugging at the heart-strings from the start. The actors themselves are outstanding – the lead player: Brian Latini – appearing like a Chaplin reincarnation. Every nuanced move drawing laughter, gasps and tears from the enthralled audience. The Kid (Gabriele Davoli) is suitably cute and precociously talented and inevitably elicits the biggest cheer from the predominately nonna crowd present on the Sunday afternoon we were there. Working hard are the remaining two members of the cast – Roberto Fazioli as the towering, glaring foil to the little tramp in the shape(s) of cop and local hard-man. Particularly good is Francesca di Franco who beautifully merges silent-cinema-luminosity with stark neo-realist angst especially in the heart-wrenching moments when she has to give up her child. 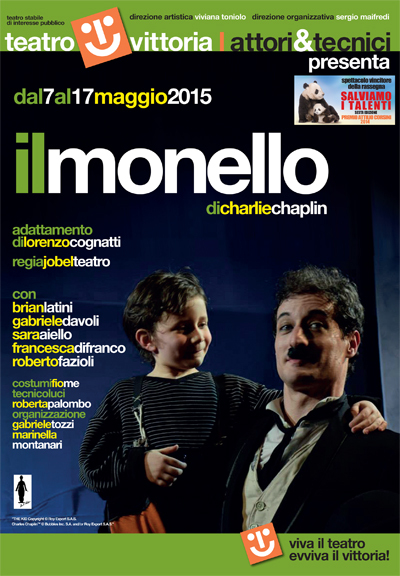 The run of Il Monello finishes this Sunday (17 May) so you’ll have to hurry to catch it. Truly, it’s a real treat and the whole idea of taking the intimate magic of classic cinema and recreating it as an intimate theatrical treat is bold and very effective. If you can’t make this one please keep Teatro Vittoria in mind for a future visit. I noticed in ‘forthcoming attractions’ a production of Coriolanus which looks visceral and exciting enough to transcend any language barrier! This entry was posted in Muppets over Italy... feelin' lucky, punk? and tagged Charlie Chaplin, Il Monello, Italian neo-realist cinema, Italian theater, Italian theatre, Rome, Teatro Vittoria, Testaccio, The Kid. Bookmark the permalink.